For other uses, see Eskimo (disambiguation). 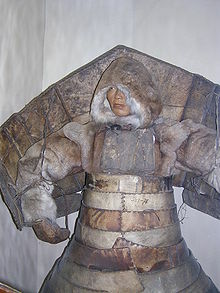 Eskimo (/ˈɛskɪmoʊ/ ESS-kih-moh) or Eskimos are the indigenous peoples who have traditionally inhabited the northern circumpolar region from eastern Siberia (Russia) to across Alaska (of the United States), Canada, and Greenland. Russian, English, French, Danish, Greenlandic and other Eskimo–Aleut languages. The two main peoples known as "Eskimo" are: (1) the Alaskan Iñupiat peoples, Greenlandic Inuit, and the mass-grouping Inuit peoples of Canada, and (2) the Yupik of eastern Siberia and Alaska. The Yupik comprise speakers of four distinct Yupik languages: one used in the Russian Far East and the others among people of Western Alaska, Southcentral Alaska and along the Gulf of Alaska coast. A third northern group, the Aleut, is closely related to these two. They share a relatively recent common ancestor, and a language group (Eskimo-Aleut). The word Eskimo derives from phrases that Algonquin tribes used for their northern neighbors. 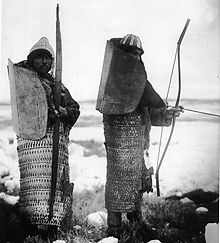 The Inuit and Yupik peoples consider the word "Eskimo" to be offensive and generally do not use it to refer to themselves, preferring to refer to themselves as "Inuit". The governments in Canada and Greenland have ceased using it in official documents. In Canada and Greenland, the term "Eskimo" is predominately seen as pejorative and has been widely replaced by the term "Inuit" or terms specific to a particular group or community. This has resulted in a trend whereby some Canadians and Americans believe that they should not use the word "Eskimo" and use the Canadian word "Inuit" instead, even for Yupik speakers. In section 25 of the Canadian Charter of Rights and Freedoms and section 35 of the Canadian Constitution Act of 1982, recognized the Inuit as a distinctive group of Aboriginal peoples in Canada. Under U.S. and Alaskan law (as well as the linguistic and cultural traditions of Alaska), "Alaska Native" refers to all indigenous peoples of Alaska. This includes not only the Iñupiat and the Yupik, but also groups such as the Aleut, who share a recent ancestor, as well as the largely unrelated indigenous peoples of the Pacific Northwest Coast and the Alaskan Athabaskans. As a result, the term Eskimo is still in use in Alaska. Alternative terms, such as Inuit-Yupik, have been proposed, but none has gained widespread acceptance. Several earlier indigenous peoples existed in the region. The earliest positively identified Paleo-Eskimo cultures (Early Paleo-Eskimo) date to 5,000 years ago. They appear to have developed in Alaska from people related to the Arctic small tool tradition in eastern Asia, whose ancestors had probably migrated to Alaska at least 3,000 to 5,000 years earlier. Similar artifacts have been found in Siberia that date to perhaps 18,000 years ago. The Yupik languages and cultures in Alaska evolved in place, beginning with the original pre-Dorset indigenous culture developed in Alaska. Approximately 4000 years ago, the Unangan culture of the Aleut became distinct. It is not generally considered an Eskimo culture. Approximately 1,500–2,000 years ago, apparently in northwestern Alaska, two other distinct variations appeared. Inuit language became distinct and, over a period of several centuries, its speakers migrated across northern Alaska, through Canada and into Greenland. The distinct culture of the Thule people developed in northwestern Alaska and very quickly spread over the entire area occupied by Eskimo people, though it was not necessarily adopted by all of them. Two principal competing etymologies have been proposed for the name "Eskimo", both derived from the Innu-aimun (Montagnais) language, an Algonquian language of the Atlantic Ocean coast. The most commonly accepted today appears to be the proposal of Ives Goddard at the Smithsonian Institution, who derives the term from the Montagnais word meaning "snowshoe-netter" or "to net snowshoes." The word assime·w means "she laces a snowshoe" in Montagnais. Montagnais speakers refer to the neighbouring Mi'kmaq people using words that sound like eskimo. In 1978, Jose Mailhot, a Quebec anthropologist who speaks Montagnais, published a paper suggesting that Eskimo meant "people who speak a different language". French traders who encountered the Montagnais in the eastern areas, adopted their word for the more western peoples and spelled it as Esquimau in a transliteration. Some people consider Eskimo derogatory because it is widely perceived to mean "eaters of raw meat" in Algonquian languages common to people along the Atlantic coast. One Cree speaker suggested the original word that became corrupted to Eskimo might have been askamiciw (which means "he eats it raw"); the Inuit are referred to in some Cree texts as askipiw (which means "eats something raw"). The first printed use of the word 'Esquimaux' comes from Samuel Hearne's A Journey from Prince of Wales's Fort in Hudson's Bay to the Northern Ocean in the Years 1769, 1770, 1771, 1772 first published in 1795. Hearne, an Englishman employed by the Hudson Bay Company, traveled to Fort Prince of Wales at present day Churchill via ship, and not overland. He is highly unlikely to have encountered French traders or their allies in his travels to have picked up a word for the present-day Inuit from them, as the fall of Quebec and the end of French activity in North America was just 6 years prior to his arrival. On the contrary, trade at Fort Prince of Wales was conducted with the Cree and the Chipewyans, and conducted at the shores of Hudson Bay at that time. Trade, by ship, with the Esquimaux was one of Hearne's first assignments. It would be on Hearne's watch that inland exploration would begin. It was in the company of Matonabbee on his third attempt to find the sources of the copper in use by indigenous peoples that Hearne encountered the Inuit as described in Massacre at Bloody Falls. 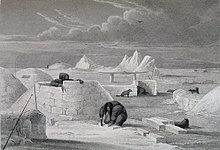 That the word 'esquimaux' as applying to the Inuit would have come from French sources, and from such southerly peoples as the Algonquians seems highly unlikely, but Hearne's use of the term and his manner of spelling it suggest that the term was already in use prior to his arrival in 1766. In Canada and Greenland, the term Eskimo has largely been supplanted by the term Inuit. While Inuit can be accurately applied to all of the Eskimo peoples in Canada and Greenland, that is not true in Alaska and Siberia. In Alaska the term Eskimo is commonly used, because it includes both Yupik and Iñupiat. Inuit is not accepted as a collective term and it is not used specifically for Iñupiat (although they are related to the Canadian Inuit peoples). 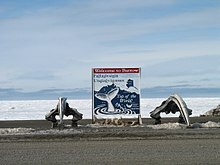 In 1977, the Inuit Circumpolar Conference (ICC) meeting in Utqiagvik, Alaska, officially adopted Inuit as a designation for all circumpolar native peoples, regardless of their local view on an appropriate term. As a result, the Canadian government usage has replaced the (locally) defunct term Eskimo with Inuit (Inuk in singular). The preferred term in Canada's Central Arctic is Inuinnaq, and in the eastern Canadian Arctic Inuit. The language is often called Inuktitut, though other local designations are also used. Despite the ICC's 1977 decision to adopt the term Inuit, this was never accepted by the Yupik peoples, who likened it to calling all Native American Indians Navajo simply because the Navajo felt that that's what all tribes should be called. The Inuit of Greenland refer to themselves as "Greenlanders" and speak the Greenlandic language. Because of the linguistic, ethnic, and cultural differences between Yupik and Inuit peoples, it seems unlikely that any umbrella term will be acceptable. There has been some movement to use Inuit, and the Inuit Circumpolar Council, representing a circumpolar population of 150,000 Inuit and Yupik people of Greenland, Northern Canada, Alaska, and Siberia, in its charter defines Inuit for use within that ICC document as including "the Inupiat, Yupik (Alaska), Inuit, Inuvialuit (Canada), Kalaallit (Greenland) and Yupik (Russia)." In 2010, the ICC passed a resolution in which they implored scientists to use "Inuit" and "Paleo-Inuit" instead of "Eskimo" or "Paleo-Eskimo". American linguist Lenore Grenoble has explicitly deferred to this resolution and used "Inuit–Yupik" instead of "Eskimo" with regards to the language branch. In a 2015 commentary in the journal Arctic, Canadian archaeologist Max Friesen argued fellow Arctic archaeologists should follow the ICC and use "Paleo-Inuit" instead of "Paleo-Eskimo". But, in Alaska, the Inuit people refer to themselves as Iñupiat, plural, and Iñupiaq, singular (their North Alaskan Inupiatun language is also called Iñupiaq). They do not commonly use the term Inuit. In Alaska, Eskimo is in common usage. Alaskans also use the term Alaska Native, which is inclusive of all Eskimo, Aleut and other Native American people of Alaska. It does not apply to Inuit or Yupik people originating outside the state. The term Alaska Native has important legal usage in Alaska and the rest of the United States as a result of the Alaska Native Claims Settlement Act of 1971. 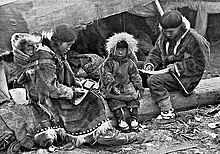 The term "Eskimo" is also used in linguistic or ethnographic works to denote the larger branch of Eskimo–Aleut languages, the smaller branch being Aleut. The Eskimo–Aleut family of languages includes two cognate branches: the Aleut (Unangan) branch and the Eskimo branch. The number of cases varies, with Aleut languages having a greatly reduced case system compared to those of the Eskimo subfamily. Eskimo–Aleut languages possess voiceless plosives at the bilabial, coronal, velar and uvular positions in all languages except Aleut, which has lost the bilabial stops but retained the nasal. In the Eskimo subfamily a voiceless alveolar lateral fricative is also present. The Eskimo sub-family consists of the Inuit language and Yupik language sub-groups. The Sirenikski language, which is virtually extinct, is sometimes regarded as a third branch of the Eskimo language family. Other sources regard it as a group belonging to the Yupik branch. Inuit languages comprise a dialect continuum, or dialect chain, that stretches from Unalakleet and Norton Sound in Alaska, across northern Alaska and Canada, and east to Greenland. Changes from western (Iñupiaq) to eastern dialects are marked by the dropping of vestigial Yupik-related features, increasing consonant assimilation (e.g., kumlu, meaning "thumb", changes to kuvlu, changes to kublu, changes to kulluk, changes to kulluq), and increased consonant lengthening, and lexical change. Thus, speakers of two adjacent Inuit dialects would usually be able to understand one another, but speakers from dialects distant from each other on the dialect continuum would have difficulty understanding one another. Seward Peninsula dialects in western Alaska, where much of the Iñupiat culture has been in place for perhaps less than 500 years, are greatly affected by phonological influence from the Yupik languages. Eastern Greenlandic, at the opposite end of the Inuit range, has had significant word replacement due to a unique form of ritual name avoidance. The four Yupik languages, by contrast, including Alutiiq (Sugpiaq), Central Alaskan Yup'ik, Naukan (Naukanski), and Siberian Yupik, are distinct languages with phonological, morphological, and lexical differences. They demonstrate limited mutual intelligibility. Additionally, both Alutiiq and Central Yup'ik have considerable dialect diversity. 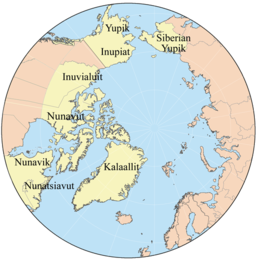 The northernmost Yupik languages – Siberian Yupik and Naukan Yupik – are linguistically only slightly closer to Inuit than is Alutiiq, which is the southernmost of the Yupik languages. Although the grammatical structures of Yupik and Inuit languages are similar, they have pronounced differences phonologically. Differences of vocabulary between Inuit and any one of the Yupik languages are greater than between any two Yupik languages. Even the dialectal differences within Alutiiq and Central Alaskan Yup'ik sometimes are relatively great for locations that are relatively close geographically. The Sirenikski language is sometimes regarded as a third branch of the Eskimo language family, but other sources regard it as a group belonging to the Yupik branch. Not to be confused with the Innu, a First Nations people in eastern Quebec and Labrador.. The Inuit inhabit the Arctic and northern Bering Sea coasts of Alaska in the United States, and Arctic coasts of the Northwest Territories, Nunavut, Quebec, and Labrador in Canada, and Greenland (associated with Denmark). Until fairly recent times, there has been a remarkable homogeneity in the culture throughout this area, which traditionally relied on fish, marine mammals, and land animals for food, heat, light, clothing, and tools. They maintain a unique Inuit culture. Inughuit of north Greenland, who speak Inuktun or Polar Eskimo. The Inuvialuit live in the western Canadian Arctic region. Their homeland – the Inuvialuit Settlement Region – covers the Arctic Ocean coastline area from the Alaskan border east to Amundsen Gulf and includes the western Canadian Arctic Islands. The land was demarked in 1984 by the Inuvialuit Final Agreement. The Iñupiat are the Inuit of Alaska's Northwest Arctic and North Slope boroughs and the Bering Straits region, including the Seward Peninsula. Utqiagvik, the northernmost city in the United States, is above the Arctic Circle and in the Iñupiat region. Their language is known as Iñupiaq. The Yupik are indigenous or aboriginal peoples who live along the coast of western Alaska, especially on the Yukon-Kuskokwim delta and along the Kuskokwim River (Central Alaskan Yup'ik); in southern Alaska (the Alutiiq); and along the eastern coast of Chukotka in the Russian Far East and St. Lawrence Island in western Alaska (the Siberian Yupik). The Yupik economy has traditionally been strongly dominated by the harvest of marine mammals, especially seals, walrus, and whales. The Alutiiq, also called Pacific Yupik or Sugpiaq, are a southern, coastal branch of Yupik. They are not to be confused with the Aleut, who live further to the southwest, including along the Aleutian Islands. They traditionally lived a coastal lifestyle, subsisting primarily on ocean resources such as salmon, halibut, and whales, as well as rich land resources such as berries and land mammals. Alutiiq people today live in coastal fishing communities, where they work in all aspects of the modern economy. They also maintain the cultural value of a subsistence lifestyle. The Alutiiq language is relatively close to that spoken by the Yupik in the Bethel, Alaska area. But, it is considered a distinct language with two major dialects: the Koniag dialect, spoken on the Alaska Peninsula and on Kodiak Island, and the Chugach dialect, spoken on the southern Kenai Peninsula and in Prince William Sound. Residents of Nanwalek, located on southern part of the Kenai Peninsula near Seldovia, speak what they call Sugpiaq. They are able to understand those who speak Yupik in Bethel. With a population of approximately 3,000, and the number of speakers in the hundreds, Alutiiq communities are working to revitalize their language. Yup'ik, with an apostrophe, denotes the speakers of the Central Alaskan Yup'ik language, who live in western Alaska and southwestern Alaska from southern Norton Sound to the north side of Bristol Bay, on the Yukon–Kuskokwim Delta, and on Nelson Island. The use of the apostrophe in the name Yup'ik is a written convention to denote the long pronunciation of the p sound; but it is spoken the same in other Yupik languages. Of all the Alaska Native languages, Central Alaskan Yup'ik has the most speakers, with about 10,000 of a total Yup'ik population of 21,000 still speaking the language. The five dialects of Central Alaskan Yup'ik include General Central Yup'ik, and the Egegik, Norton Sound, Hooper Bay-Chevak, and Nunivak dialects. In the latter two dialects, both the language and the people are called Cup'ik. Siberian Yupik reside along the Bering Sea coast of the Chukchi Peninsula in Siberia in the Russian Far East and in the villages of Gambell and Savoonga on St. Lawrence Island in Alaska. The Central Siberian Yupik spoken on the Chukchi Peninsula and on St. Lawrence Island is nearly identical. About 1,050 of a total Alaska population of 1,100 Siberian Yupik people in Alaska speak the language. It is the first language of the home for most St. Lawrence Island children. In Siberia, about 300 of a total of 900 Siberian Yupik people still learn and study the language, though it is no longer learned as a first language by children. About 70 of 400 Naukan people still speak Naukanski. The Naukan originate on the Chukot Peninsula in Chukotka Autonomous Okrug in Siberia. Some speakers of Siberian Yupik languages used to speak an Eskimo variant in the past, before they underwent a language shift. These former speakers of Sirenik Eskimo language inhabited the settlements of Sireniki, Imtuk, and some small villages stretching to the west from Sireniki along south-eastern coasts of Chukchi Peninsula. They lived in neighborhoods with Siberian Yupik and Chukchi peoples. As early as in 1895, Imtuk was a settlement with a mixed population of Sirenik Eskimos and Ungazigmit (the latter belonging to Siberian Yupik). Sirenik Eskimo culture has been influenced by that of Chukchi, and the language shows Chukchi language influences. Folktale motifs also show the influence of Chuckchi culture. 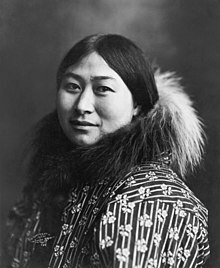 The above peculiarities of this (already extinct) Eskimo language amounted to mutual unintelligibility even with its nearest language relatives: in the past, Sirenik Eskimos had to use the unrelated Chukchi language as a lingua franca for communicating with Siberian Yupik. Many words are formed from entirely different roots from in Siberian Yupik, but even the grammar has several peculiarities distinct not only among Eskimo languages, but even compared to Aleut. For example, dual number is not known in Sirenik Eskimo, while most Eskimo–Aleut languages have dual, including its neighboring Siberian Yupikax relatives. Little is known about the origin of this diversity. The peculiarities of this language may be the result of a supposed long isolation from other Eskimo groups, and being in contact only with speakers of unrelated languages for many centuries. The influence of the Chukchi language is clear. Because of all these factors, the classification of Sireniki Eskimo language is not settled yet: Sireniki language is sometimes regarded as a third branch of Eskimo (at least, its possibility is mentioned). Sometimes it is regarded rather as a group belonging to the Yupik branch. ^ a b Pamela R. Stern (2013). Historical Dictionary of the Inuit. Scarecrow Press. p. 2. ISBN 978-0-8108-7912-6. ^ a b c d e f Kaplan, Lawrence. "Inuit or Eskimo: Which name to use?" Alaskan Native Language Center, UAF. Retrieved 14 Feb 2015. ^ a b c Israel, Mark. "Eskimo". Alt-usage-english.org. Archived from the original on 2012-04-03. Retrieved 2012-06-13. ^ Jan Svartvik; Geoffrey Leech (2016). English – One Tongue, Many Voices. Palgrave Macmillan UK. p. 97. ISBN 978-1-137-16007-2. Today, the term "Eskimo" is viewed as the "non preferred term". Some Inuit find the term offensive or derogatory. ^ "Inuit or Eskimo? - Alaska Native Language Center". Although the name "Eskimo" is commonly used in Alaska to refer to all Inuit and Yupik people of the world, this name is considered derogatory in many other places because it was given by non-Inuit people and was said to mean "eater of raw meat." ^ "Obama signs measure to get rid of the word 'Eskimo' in federal laws". 24 May 2016. ^ "Canadian Charter of Rights and Freedoms". Department of Justice Canada. Retrieved August 30, 2012. ^ "Rights of the Aboriginal Peoples of Canada". Department of Justice Canada. Retrieved August 30, 2012. ^ Houghton Mifflin Company (2005). The American Heritage Guide to Contemporary Usage and Style. Houghton Mifflin Harcourt. p. 313. ISBN 0-618-60499-5. ^ "Native American populations descend from three key migrations". UCL News. University College London. 2012-07-12. Retrieved 2018-12-12. ^ Holton, Gary. "Place-naming strategies in Inuit-Yupik and Dene languages in Alaska. ", Academia.edu, Retrieved 27 Jan 2014. ^ Mailhot, J. (1978). "L'étymologie de «Esquimau» revue et corrigée," Etudes Inuit/Inuit Studies 2-2:59–70. ^ a b "Cree Mailing List Digest November 1997". Retrieved 2012-06-13. ^ Mailhot, Jose (1978). "L'etymologie de "esquimau" revue et corrigée". Etudes/Inuit/Studies. 2 (. 2). ^ Goddard, Ives (1984). Handbook of North American Indians, Vol. 5 (Arctic). Smithsonian Institution. ISBN 978-0-16-004580-6. ^ a b "Setting the Record Straight About Native Languages: What Does "Eskimo" Mean In Cree?". Native-languages.org. Retrieved 2012-06-13. ^ a b "Eskimo". American Heritage Dictionary of the English Language: Fourth Edition, 2000. Bartleby. Archived from the original on 2001-04-12. Retrieved 2008-01-13. ^ a b Pamela R. Stern. Historical Dictionary of the Inuit. Books.google.com. Retrieved 2012-06-13. ^ a b Robert Peroni and Birgit Veith. "Ostgroenland-Hilfe Project". Ostgroenland-hilfe.de. Archived from the original on 2012-03-18. Retrieved 2012-06-13. ^ a b "Inuktitut, Greenlandic." Ethnologue. Retrieved 6 Aug 2012. ^ Inuit Circumpolar Council. (2006). Charter Archived March 5, 2010, at the Wayback Machine Retrieved on 2007-04-06. ^ Inuit Circumpolar Council (2010). "On the use of the term Inuit in scientific and other circles" (PDF) (Resolution 2010-01). ^ Grenoble, Lenore A. (2016). "Kalaallisut: The Language of Greenland". In Day, Delyn; Rewi, Poia; Higgins, Rawinia (eds.). The Journeys of Besieged Languages. Cambridge Scholars. p. 284. ISBN 978-1-4438-9943-7. ^ Friesen, T. Max (2015). "On the Naming of Arctic Archaeological Traditions: The Case for Paleo-Inuit". Arctic. 68 (3): iii–iv. doi:10.14430/arctic4504. hdl:10515/sy5sj1b75. ^ a b c d Michael Fortescue; Steven Jacobson; Lawance Kaplan. Comparative Eskimo Dictionary with Aleut Cognates. Alaska Native Language Center, University of Alaska Fairbanks. ^ a b c d e f g h Kaplan, Lawrence. (2001-12-10). "Comparative Yupik and Inuit". Alaska Native Language Center, University of Alaska Fairbanks. Retrieved on August 30, 2012. ^ a b c "thumb". Asuilaak Living Dictionary. Retrieved 2007-11-25. ^ "Greenland." CIA World Factbook. Accessed 14 May 2014. ^ "Yupik". (2008). In Encyclopædia Britannica. Retrieved January 13, 2008, from: Encyclopædia Britannica Online Retrieved August 30, 2012. ^ "Language Loss & Revitalization". alutiiqmuseum.org. Retrieved 2018-06-12. ^ "Central Alaskan Yup'ik". Alaska Native Language Center. University of Alaska Fairbanks. Archived from the original on February 6, 2007. Retrieved 2007-04-06. ^ a b Alaska Native Language Center. (2001-12-07).St. 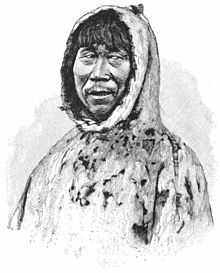 Lawrence Island Yupik (Siberian Yupik). Alaska Native Language Center, University of Alaska Fairbanks. Retrieved on August 30, 2012. ^ Linguist List's description about Nikolai Vakhtin's book: The Old Sirinek Language: Texts, Lexicon, Grammatical Notes. The author's untransliterated (original) name is "Н.Б. Вахтин Archived September 10, 2007, at the Wayback Machine". ^ Языки эскимосов. ICC Chukotka (in Russian). Inuit Circumpolar Council. Archived from the original on 2014-10-26. ^ "Ethnologue Report for Eskimo–Aleut". Ethnologue.com. Retrieved 2012-06-13. Nuttall, Mark. Encyclopedia of the Arctic. New York: Routledge, 2005. ISBN 978-1-57958-436-8. Vakhtin, Nikolai (1998). "Endangered Languages in Northeast Siberia: Siberian Yupik and other Languages of Chukotka". In Erich Kasten (ed.). Bicultural Education in the North: Ways of Preserving and Enhancing Indigenous Peoples’ Languages and Traditional Knowledge (PDF). Münster: Waxmann Verlag. pp. 159–173. ISBN 978-3-89325-651-8. Archived from the original (PDF) on 2007-04-13. Retrieved 2019-04-22. Меновщиков, Г. А. (1964). Язык сиреникских эскимосовref Фонетика, очерк морфологии, тексты и словарь. Москва • Ленинград,: Академия Наук СССР. Институт языкознания. The transliteration of Меновщиков 1964: 38 author's name, and the rendering of title in English: Menovshchikov, G. A. (1964). Language of Sireniki Eskimos. Phonetics, morphology, texts and vocabulary. Moscow • Leningrad: Academy of Sciences of the USSR. Wikimedia Commons has media related to Eskimo. Look up eskimo or Eskimo in Wiktionary, the free dictionary. University of Washington Libraries Digital Collections – Alaska and Western Canada Collection Images documenting Alaska and Western Canada, primarily Yukon and British Columbia, depicting scenes of the Gold Rush of 1898, city street scenes, Eskimo and Native Americans of the region, hunting and fishing, and transportation.